When my day is stressful, and sixty minutes in an hour just aren’t enough, I’ve found a great release close to The Foxtrot–a quiet hike along Gatlinburg’s Little Pigeon River. The trees form a lush, green canopy. The river gurgles over rocks and around sandy banks. And I feel the stress of the day wash away. An arched bridge of the river is my first real stop to watch the rainbow trout jump. Of course Bob always accuses me of stopping every five minutes to tie my shoe. 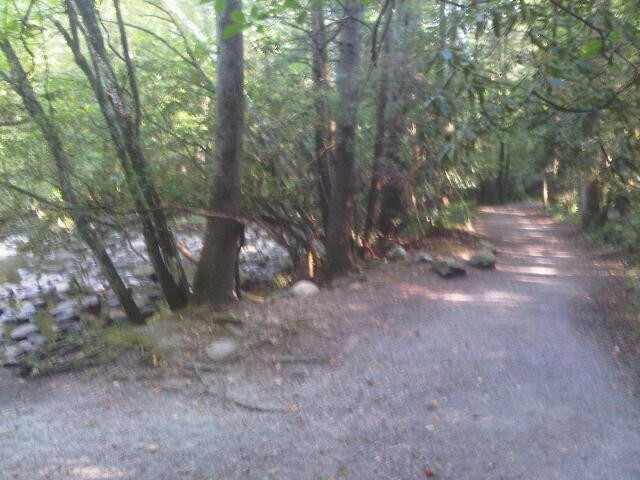 Well, I don’t hike for speed, but for the beauty of the Great Smoky Mountains. We are kindred spirits. I also love to take a hike to relieve stress, or otherwise just to explore and get some exercise to counteract the effect of my ever increasing sweet tooth. I, too, do not hike for speed; I am more a hike for comfort kind of guy.